The Programme aims at supporting the rehabilitation of torture survivors in the Middle East and North Africa region. Through trainings, capacity-building, supervision and financial support, DIGNITY strengthens the multidisciplinary and professional rehabilitation of torture survivors across the Middle East and North Africa. In Jordan, DIGNITY´s local partner in this programme is the Institute for Family Health (IFH) which is under Nour Al Hussein Foundation. The institute started as a trauma center but now IFH has outreach centers around the Kingdom. The Back to Life Programme was implemented in Jordan when DIGNITY started its work in the country in 2008 and established a collaboration with IFH. The partnership is heavily focused on capacity building of health professionals who are working at IFH and dealing with trauma and torture cases. The trauma resulting from torture, ill-treatment, PTSD from fleeing war zones has a specific need for treatment through highly specialized multidisciplinary methods to ensure rehabilitation and reintegration. These methods in the past year have been taught through trainings and followed up with supervision are being institutionalized within IFH. The need for rehabilitation of torture victims and traumatized refugees is enormous in the region of the Middle East and North Africa. Torture survivors carry scars on body and soul, and many suffer from chronic pain, depression, anxiety or PTSD. The trauma negatively effects their ability to care for their family and contribute to society. With the proper treatment the survivors can be rehabilitated, so that they can once again return to their lives as husbands, wives, parents and colleagues. 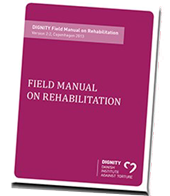 In 2008, DIGNITY’s local partner Institute for Family Health (IFH) opened the first interdisciplinary rehabilitation clinic for torture survivors in Jordan. Since then, they have helped thousands of victims from multiple countries, including large numbers of refugees from Syria and Iraq. As part of the regional programme Back to Life, DIGNITY provides trainings, capacity-building, and technical and financial support to IFH. Jordan is a constitutional monarchy with the government, the parliament and the King. Jordan has borders to Syria, Iraq, Saudi Arabia and the West Bank (Palestine/Israel), which makes Jordan more or less surrounded by war and conflict zones. Nonetheless, Jordan is being considered as the most (or one of the most) stable and safe country in the region per the latest Gallup index. With the surrounding countries, Jordan is facing a general threat of terror which pressures the military and makes safety and stability a top priority in state politics. On many levels the state has succeeded to keep terrorism out of the country. Despite this, Jordan also prioritize to work on human rights, however, the space for that is being limited. Jordan still has a long way to go to obtain international standards but the status of human rights is in some areas slowly moving forward. E.g. In the summer 2017, the Jordanian government abolished the law that before allowed rapists to marry their victims to avoid punishment and the state is as well committing to combat torture. Furthermore, Jordan’s capacity is challenged and the living standards have aggravated as a consequence of the huge influx of refugees. 2,175,491 Palestinians are registered refugees in Jordan and around 1,4 million Syrian refugees have entered Jordan since 2011. A huge number of refugees carry traumas that might affect their everyday life and put them in need of therapy or rehabilitation in order for them to have a functional life and contribute to society. For traumatized refugees an obstacle to seek help can be the stigma around mental health support in the society which makes less people seek these kinds of services. DIGNITY supports the continued education of the IFH centers’ employees, in order to build their capacity in treating torture survivors. The Back to Life programme is funded by the Danish Ministry of Foreign Affairs under the Danish Arab Partnership Programme (DAPP) and implemented within the framework of the bilateral agreement between Jordan and Denmark. The Karama Programme aims at eliminating the use of torture and other forms of ill-treatment in places of detention in Jordan.